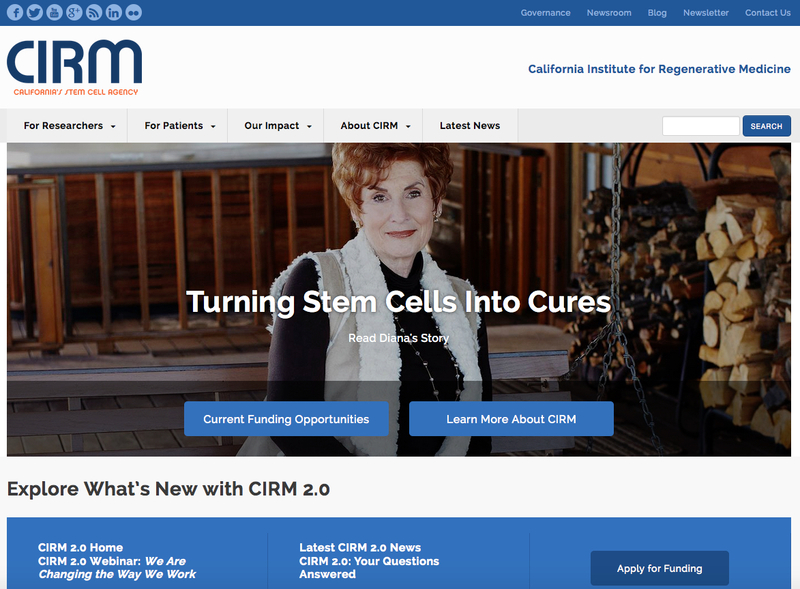 CIRM has experienced many exciting changes over the past year: we’ve welcomed a new president, revamped our blog and—perhaps most importantly—announced a radical overhaul in how we fund stem cell research with the launch of CIRM 2.0. That’s not even mentioning the 11 projects we are now funding in clinical trials. Patients, patient advocates and the public at large who are helping others understand how CIRM-funded scientists are turning stem cells into cures. We are also using this opportunity to improve the way we are viewed on mobile devices. With up to 40 percent of our visitors coming to cirm.ca.gov via a smartphone or tablet, we wanted to create a superior mobile user experience—so that people can easily access the same content whether they are at home or on the go. We began this project just a few short months ago, and are thankful for a stellar team of in-house staff and contractors who each dove in to lend a hand. We are especially grateful to Radiant, who worked with CIRM to develop an improved design and navigation. As part of the process of updating the website we also took the opportunity to update our logo. The old logo was ten years old, an eternity in the age of the Internet. We wanted something that reflected our new streamlined approach to funding, something that was visually appealing and contemporary and something that immediately connected the viewer to who we are and what we do. We hope you like it. So please, take a look around at the new cirm.ca.gov—we hope you enjoy using it as much as we enjoyed creating it for you. And of course if you have any thoughts or suggestions on how we can improve this even more we’d love to hear from you in the comments below.